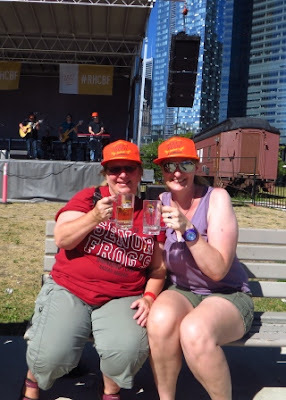 Toda, Teena and I were at the fourth annual Roundhouse Summer Craft Beer Festival in the park just outside of Steam Whistle Brewery. We've been to all the summer ones and the winter ones! Here's Teena with the Pan Am flame in the background. The Pan Am flame close up. Teena and our friend Darlene. Yesterday was sold out but when we arrived today just before noon, the crowd was sparse but filled up as the day went on. A very nice ESB that I have had before from Collingwood Brewery. My friend at work has been bugging me to try the dark lager from Side Launch Brewery. Today I did and it was quite good. I love Black Oak Brewery's Break of Dawn APA. Cameron's were out of the saison, which I would have loved to try, the danger of going on a Sunday, so I went to a beer I know so well, their RPA. I love saisons and Nickle Brook's Payspn Saison is very tasty. The bands were quite good, especially Redsteps in the bottom picture. A Genius of Suburbia from Flying Monkeys. A Lone Pine IPA from Sawdust City. It was quite good. The only beer festival I have been to which has a train crossing! The festival started to fill up as the afternoon went on. I enjoyed a slice of wood fired pizza from the Canuck Pizza Truck. This is the third or fourth time having a Sunlight Park Saison. There's a reason for that. I enjoyed the Bord du Lac saison from Amsterdam Brewery. I really enjoyed the festival but have one compliant. This year it was opened to all the public, which meant I paid my money to come in, was IDed but had to fight for space to sit at benches and in the shade with those that just came to eat. In the end, we were sitting with a family of older people and children. THIS IS A BEER FESTIVAL! Having children and families being allowed to attend should not be allowed. If necessary, have the food trucks in a common area so festival people can get food and return to the festival and those not in attendance can get food and go to another area. We lost half our picnic table to people who had not paid to attend! Lose the kids. They should not be at a beer drinking event. It's unfair to the ones who pay, and can only lead to bad situations. Other than that, it was another great day at the Roundhouse Summer Craft Beer festival.